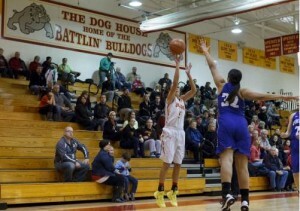 Batavia girls’ basketball legend, senior guard Liza Fruendt, has just finished up her athletic career at BHS. With four years on varsity and two school records broken, Fruendt has left behind a legacy in Batavia athletics. Going into the last few weeks of your career as a Batavia basketball player, what are your feelings? Going into my last few weeks of my career is definitely a little heart wrenching. After playing four years of varsity basketball, it’s going to be an adjustment, but I’m savoring every moment I can. How do you feel that the team has been doing this season? Our team has been doing so well this season. Everyone works so hard and wants to win just as much as every other person on the team, so it’s a great environment. What is it like to be one of the leaders of your team? Has this role changed your outlook at all? It’s pretty fun, but Erin [Bayram, ‘14] and I definitely always have to think about everything we are doing and remember that we are the role models of the team and of the program. You recently broke the all-time scoring record for the school and the record for most points scored in a single game. How does that feel? It’s pretty cool. I’m mainly just happy we got the W in both of those games! Do you feel that you have cemented a legacy in Batavia basketball history? Maybe because of the records, but I’m not worried about that stuff. I just want to make sure I am doing everything to keep winning and just making sure that I’m working hard. Hopefully then that can rub off on others. What are you looking forward to while playing at Missouri State? I’m looking forward to being in a different environment and just playing at the next level. I’m pretty excited. Wish Liza luck as she takes her outstanding talent down to Missouri State. Whether it is her athletic ability or leadership, she will be a much missed part of Batavia athletics.